How often does a a tour of downtown Los Angeles include stopping for a drink on Skid Row? We found one and for fans of cult poet Charles Bukowski it is a dream come true. The tour explores where Bukowski bought his liquor, made his home and wrote Post Office. For those of you lurking behind the bushes with your star map of Hollywood or Beverly Hills, this may not be the most appetizing way to spend a Saturday. But if you want to have a little peek into the life of Charles Bukowski’s, then there is a bus tour that will lead you to his favorite haunts. Led by Richard Schave and Kim Cooper, Esotouric has made a name for itself taking adventurous Angelinos and intrepid (not to mention slightly morbid) tourists across the city to numerous crime sites, on to the trail of the Black Dahlia and to the homes, haunts and watering holes of famous noir writers Raymond Chandler and James M. Cain. Bukowski is the newest addition to their expanding roster of anti-tours. A poet and a novelist, Charles Bukowski’s work seemed directly influenced by his geography. Living and working in Los Angeles, Bukowski’s prodigious works seems to detail his path all around the city. Our stroll through Bukowski’s life in Los Angeles began at Phillipe The Original. The restaurant famous for its French dip sandwiches opened its doors to visitors in 1908 and have been serving up beef, pork and ham sandwiches ever since. Inside, hay is strewn all over the floor and customers put their orders at the slightly irritated cashier ladies behind the counter. After eating up our sandwiches, the tour continued on to the Terminal Annex where Bukowski worked most of his life as a mail sorter. The Terminal Annex building is an art deco masterpiece still home to a small post office, as well as a series of stunning murals. Bukowski worked at the post office for a number of years during which time he wrote numerous poems. The tour then continued to the Los Angeles Central Library where Bukowksi spent many of his free time. There, the “Poet Laureate of Skid Row” probably spent hours upon hours in search of finding his voice. From the Central Library, the tour headed northwest to Bukowski’s former residence on DeLongpre Street in East Hollywood. Though currently scheduled to be demolished, Esotouric and other bibliophiles are fighting to have the building declared a heritage site and thereby preserved for future Bukowski fans to see. A non-descript bungalow, the De Longpre residence became a witness to many of the poet’s antics and creative processes. Appropriately, the next stop on the tour was the Pink Elephant, the liquor store where Bukowski ordered his liquor for delivery to avoid adding more to his already innumerable DUI arrest. On the way, Director John Dullaghan shared parts his documentary film of Bukowski titled Bukowski: Born into This, adding color and details of the writer’s life, loves and lighter side. The tour then stopped in front of the single occupancy residence that he shared with Jane Cooney Baker, with whom he had his most torrid and famous affair. The façade of the SRO was used for the movie based on Bukowski’s work titled Barfly. 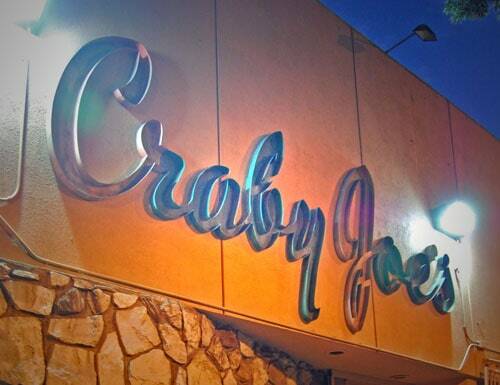 The tour made its final stop at Crabby Joe’s. A relic amongst the rising lofts and condos sprouting up in downtown LA; Crabby Joe’s may be the last of LA’s true dive bars. With its $2 beers and jarred pickled pig feet, one could easily imagine Bukowski sitting in one of the stools, belligerently conversing with another equally drunk companion. The tour ends back at Phillipe The Original. If another french dip sandwich is not on your menu, then head over to the numerous Chinese restaurants within walking distance to end the day with a Chinese meal or head to one of Bukowski’s favorite restaurants, Musso and Frank Grill. Established in 1919, the restaurant has seen its share of literary stars like Raymond Chandler and Ernest Hemingway. To cap of this evening exploring one of Los Angeles’ most interesting and controversial writers head to your favorite dive bar or perhaps do what Bukowski would have done, return home, order a bottle of liquor to be delivered and churn out prolific poetry.